The Motorola Droid 2 succeeds the hot-selling Droid with an improved keyboard and a smoother design. Is this still the phone that should carry Verizon's Android flag? The Motorola Droid 2 doesn't update much from the original Motorola Droid, but the small tweaks and additions add up to a significantly new experience. Motorola's new MotoBLUR features are a nice addition to Android, but this phone has always been about trade-offs, balancing a smartphone made for enthusiasts with its mass market, action hero appeal. 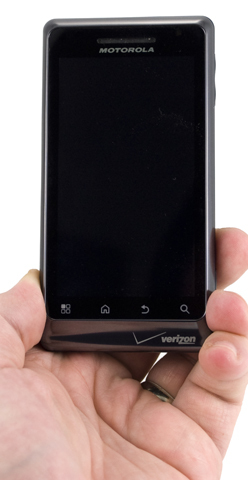 Is the Droid 2 still Verizon's flagship smartphone, or has it been surpassed by so many competitors? Verizon Wireless today announced that the Android 2.3 Gingerbread update is available to the Motorola Droid R2D2 edition. Instructions are available from Verizon's support site. Motorola's flagship smartphones for 2016 are the Moto Z Droid and Moto Z Force Droid for Verizon Wireless. These Android smartphone are unique thanks to their slim, metal designs and swappable modular back panels. You'd recommend this piece of crap, which has serious reception issues and connectivity issues, is slow as a dog, can't make it through a half-day, and a worthless camera. Does anyone anymore have the balls to stand up and say "Gee, this is yet another crappy Android handset?" Sure it's better than an LG Ally, but what isn't? That's like saying it is better than a PCD Quickfire or Motorola Q. This is just a big bucket of fail. At least I agree with you on the aesthetics of this. Then again, you also whined about the aesthetics of the iPhone 4. A VCR is right twice a day. It is not "slow as a dog," though my dog outruns me on a bad day. Compared to a small selection of fast Android phones on the market, the Droid 2 is slower, but it's faster than 90% of the smartphones you can buy. Great review. I just wanted to contribute that pressing and holding the search command on the glass screen is the same as clicking the voice command on the keyboard. The battery on mine seems to be okay for my purposes. The only function that tends to deplete the battery life is Google's Navigate. I also do not suffer the "signal loss" that many people are complaining about. The signal strength for the Droid 2 has been consistent with other phones I've owned. It does not do better nor worse in any dead zones which are notorious for dropped signals. I have had the D2 for 3 days now. Previously I had a Pixi Plus and Incredible. The reception and battery time on the D2 easily blows away both of those other phones. I find places where I was barely able to get calls on the other 2, I now actually have 2-3 bars and have clear calls. I use Touchdown with push and talk about 3000 minutes per month. By the end of the work day, I still have 60-70 percent battery left. The Droid 2 uses a two-part case since it's a slider. Since it has no hole in the body to put a wrist strap through, most would want to use a case to protect the phone. Well, when you snap the top portion of the case on, it then semi-blocks the top row of keys on the physical keyboard, making it MUCH harder to type on that top row. Motorola should have designed this phone so that when you slide it open, it opens maybe 1/8 of an inch more to give more space above that top keyboard row. Any case will now interfere with typing. "Duh". A better-designed case wouldn't have that problem.